You are probably thinking all Shelby interiors are the same. However, 1968 Shelbys used three different interiors. You may also have an additional letter "A" in your interior code. This is called a deviation code. Cars with the deviation did not recieve the A-pillar padding. It appears this change was made around the end of February 1968. I got an email asking me if all cars used the deluxe (woodgrain) steering wheel ? My immediate response was "yes". After further review, I located several cars built with the standard, non-woodgrain wheel. These cars were all built around the same time and the build sheets indicate the non-deluxe wheel. 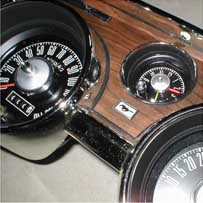 All 1968 Shelbys used the deluxe interior dash. The dash features a 140 speedometer with a trip odometer and the 8 grand tachometer. One good way to spot an original dash is to look for the chrome border around the high beam indicator light. On service replacements this border is usually black. It is absent on most reproductions. I have seen these different shifter handles used on 1968 Shelbys. 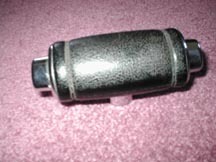 The first handle was used on GT 350 and GT 500 automatics. It is a black plastic handle. There may also be a saddle colored version ? I have seen this handle on very late built GT 350s. 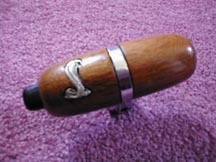 This wooden handle was used on GT500KRs with automatic transmissions. It is part number S8MS-7213-A. 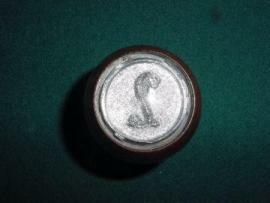 The 1968 version has the snake on the left side. Next, we have the 4 speed shift handle. 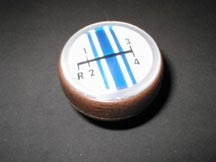 It is the Ford deluxe knob, with blue racing stripes. 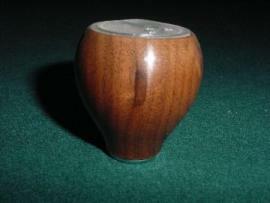 Shelby assembly drawings also show a walnut "COBRA" knob. It carries the part number S8MS-7213-B. According to the drawings it was to be used on all GT 500 KR 4spds. 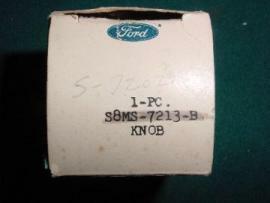 Some cars may have used the Ford deluxe knob. 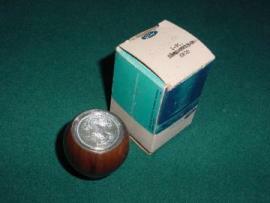 Scott sent some awesome pictures of the super, rare 4spd shift knob. Best of all, it's NOS! 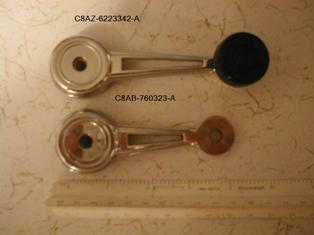 There were also several "over the counter" handles, but these are the production handles. 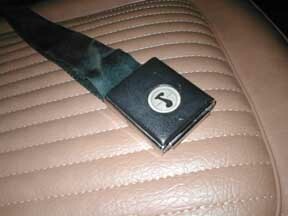 All cars used black seat belts. This included the saddle interior cars. The buckles are metal and differ from the deluxe belts used on Mustangs in 1968. They are the same as earlier deluxe buckles (1967 and before). My experience has been that window regulator cranks are shorter on 1968 Shelbys. I suspect this is because the deluxe, interior door grilles. Most people are not aware of this difference and the shorter handles are more difficult to find. If you are restoring a GT350 or a GT500 be aware of the differences in the dash emblems. Current reproductions of the emblem are not correct. They have a raised snake. Original emblems are flat. 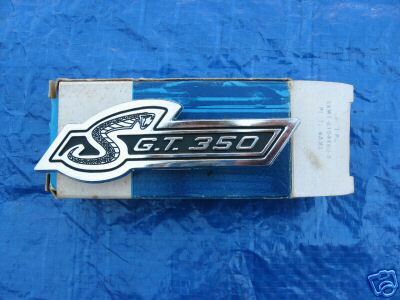 The GT500 KR emblem does have a raised snake with a black background (not pictured).